As the only fine artist authorized to paint Peanuts comic strip characters, Tom is mostly known for his Charles Schulz-influenced paintings, which decorate the walls of his studio located on bustling Abbot Kinney Boulevard. He discusses Schulz, his upcoming exhibit at Mouche Gallery of Beverly Hills and the constant evolution of his Venice Beach neighborhood after taking me on a tour of his home base. Tom incorporates media like acrylic paint and varnish on canvas and paper, but he also utilizes raw wood, medium-density fiber panels, plastic cups and polyester pom-pom balls to create the visually stunning Chop Chop Chop, Performance Art and Medal of Free Dumb pieces that line the main showroom of his studio space. While he’s widely known for these brightly colored works, it’s his black-and-white Schulz-influenced pieces from the past 13 years – as well as 15 exclusive new works – that are being featured in Raw: Black and White Works From 1998-2016 at Mouche Gallery from Feb. 27 through March 16. Appreciating the black-and-white rawness of a drawing is something Tom has done since his childhood in Washington, D.C. and San Francisco. In his downstairs workroom, where he normally works on small paper drawings and paintings, a beautiful black-and-white painting on raw wood and a massive plastic-cup sculpture that have been retrieved from other locations for the Mouche Gallery show fill the area. Tom instructs me to look at the sculpture from a certain angle to see how it resembles a piano, and I wonder how much time the artist has spent staring at work of his own as well as others over the course of his life. Young Tom eventually studied art and architecture at Yale University, performance independent study under Earl Hofmann at St. Mary’s College and did post-graduate work at Musée de l’Orangerie in Paris. He began exploring artistic anatomy, doing muscle and skeleton paintings, and as he was finishing school in the early 1980s, the art world was taking a turn. Then Tom met Charles M. Schulz. “I was trying to draw his stuff for a project, and I couldn’t get it. I just didn’t understand the language, the cartooning to it. It was so abbreviated compared to the kind of drawings that I was used to doing that I couldn’t get past it – until I put his drawing in a projector, blew it up on a huge wall and saw the lines as paintbrush strokes. I went, ‘Oh my god, this looks just like the abstract paintings in black and white that I studied in school,’” he says. “I was expecting to meet a cartoonist, but because I got to know him as an artist, I got to know him in a completely different way. How does a cartoon strip get published every single day for 50 years and not have something else to it than just cartoon strip with cute characters? There’s got to be something much deeper in it, and that’s what I saw in his work when I was studying it. After a couple of years, Tom could draw Schulz’ line just like him – not copying him but drawing an object the way he would draw it – and began creating authentic Schulz-style drawings for magazines such as Time and Good Housekeeping, in art for the White House and the majority of the MetLife campaign. Knowing Tom could draw his line exactly like he would draw it in these marketing pieces allowed Schulz to continue dedicating himself completely to the comic strip. Simultaneously, Tom’s discussions with Schulz were influencing him so much that his skeleton paintings were becoming a bit boring to him, but after eight years of these talks he wasn’t ready to take the plunge and incorporate these techniques and theories into pieces of his own. “I knew I could somehow work in his visual subject matter but didn’t know how without just doing Peanuts paintings because neither of us wanted that. It couldn’t be a painterly version of what he did, it had to be something that came from me, with a direction that came from me,” he says. It took death staring him in the face as a cancer patient to give Tom the epiphany he needed to incorporate Schulz’s characters into his own work but never in a literal way. He made sure that the work upheld Schulz’s idea of the familiar done in an unfamiliar way, as well as infusing life into each piece as much as possible. This principle is certainly felt when viewing Tom’s latest group of paintings, entitled Waves of Influence, which he’s working on in the upstairs area of his studio. 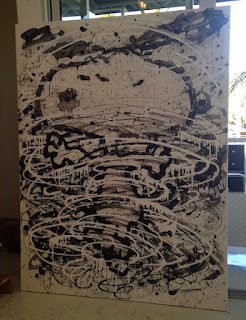 As I examine, the black-and-white piece for the Raw exhibition, Surfing with Franz and Willem – as in Franz Kline and Willem de Kooning – Tom explains that not only is the tiny Snoopy in the painting influenced by Schulz but so is the giant wave. After having lived in D.C., San Francisco, Paris, New York, Baltimore and London, Tom and his wife, Jennifer, decided to make Venice their home. The couple also spends part of the year on the island of Taha’a, Tahiti. Tom says he fell in love with Venice Beach at first sight. It’s obvious why Tom has kept Eberhart Studios in the same location for almost 20 years, even through all the ups and downs the area has experienced. Raw: Black and White Works From 1998-2016 debuts with a premiere party from 7 p.m. to 8 p.m. Feb. 27 at Moche Gallery (340 N. Beverly Drive, Beverly Hills 90210). The exhibit is open to the public from Feb. 28 through March 16. For more information, visit mouchegallery.com and everhartstudio.com. The staff here is actually competent and friendly, unlike other places with their pretentious staff guys. The Chicago event venues were magnificent and modern, and the seating was comfy. Truly, the food was heavenly and as a visitor I am glad for finding this one.